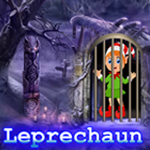 Leprechaun Rescue Game is another point and click room escape game Developed by Games 4 King Team. There were some homes in a beautiful gorge. It was so beautiful to look at. The temperature in the snow is very low. There is a Leprechaun in a beautiful home. It is your duty to save the leprechaun from where you are kept. It will help you find the hidden clues to save that leprechaun. Find the tricks and congratulate the leprechaun and win the game. This game is highly desirable. Good luck and have a fun!